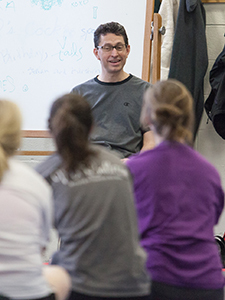 In his classroom, Professor Andy White uses yoga to help theatre students connect to their bodies, minds, and spirits. As soon as he utters those words, though, Professor White acknowledges that those distinctions aren’t firm ones — body, mind, and spirit all interconnect. It’s a level of connection he sees over and over, in theatre and in life. While he teaches courses in voice and diction, acting, movement, and more, he sees those disciplines are interconnected as well. Yoga informs all of those areas. The well-known physical postures, or asanas, help actors gain awareness of their movements. In voice training, Professor White includes mindful breathing practices (pranayama). Finally, he emphasizes the concentration of attention, another limb of yoga — only with concentration can actors experience and portray a character, he says. Professor White acted professionally for many years before returning to Valpo to teach. (He graduated from Valpo in 1990, and later earned his MFA in Acting through a joint program at Carnegie Mellon and the Moscow Art Theatre.) Although he had already attained a position as an ensemble member at the European Repertory Company, Professor White says that the opportunity to teach at his alma mater was too attractive to turn down. Since coming to Valpo, Professor White has published several articles on spirituality and theatre and edited a book on the famous actor and theatre theorist Konstantin Stanislavsky. He says that he is grateful to teach Valparaiso University, where his research can co-exist with and inform his teaching and mentorship of undergraduate students. The lessons he teaches in the classroom are reinforced on stage through the many mainstage productions he directs. “I think theatre is transformative, and actors can be empowered to make social change through their artistry,” Professor White says. For him, though, the most life-changing connections are now made through his role of teacher.